On February 21, 2012, astronomers using the Hubble Space Telescope announced that they had obtained strong supporting evidence that GJ 1214 b mostly likely has a steamy atmosphere of water based on analysis of its colors in infrared light. 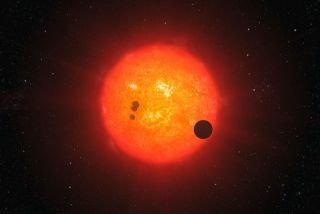 They studied the planet when it crossed in front of its host star to observe the star's light as it was filtered through the planet's atmosphere, which provided clues on its mix of atmospheric gases. Descriminating between a steamy and a hazy atmosphere, they found the spectrum of GJ 1214 b to be featureless over a wide range of wavelengths (or colors), which is most consistent with a dense atmosphere of water vapor at an estimated temperature of 450 degrees Fahrenheit, or 230 degrees Centigrade (Hubble news release; and CfA news release). 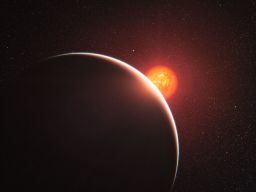 On March 11, 2011, a team of astronomers using older observational data from NASA's infrared Spitzer space telescope with newer data that they collected through the MEarth Project submitted a paper confirming that the "warm" super-Earth GJ 1214 b does not have an atmosphere composed of an outer gas layer hydrogen and helium like Uranus or Neptune, with high statistical confidence (over 99.99 percent). The team was also able to provide better support for their earlier conclusion that the planet's atmosphere is likely to be "dominated" by elements heavier than hydrogen and helium with a water mass fraction of over 10 percent water vapor (with over 99.7 percent confidence), but possibly over 50 percent (68 percent confidence). On the other hand, they also estimated that the planet's equilibrium temperature to be around 282° Celsius or 539° Fahrenheit (555 kelvin). Using data from two consecutive transits of planet b across its host star, moreover, the team failed to detect the presence of other planets in the GJ 1214 system through their gravitational influence on planet b's orbit through (Desert et al, 2011; and Jon Voisey, Universe Today, March 15, 2011). Large and jumbo animation slides. by thick clouds or hazes (more). On December 1, 2010, a team of astronomers announced the results of the first analysis of the atmosphere of a super-Earth planet, GJ 1214 b, using the European Southern Observatory's Very Large Telescope. 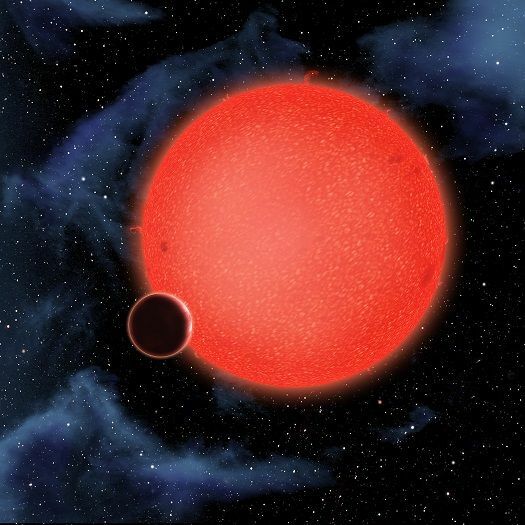 The planet's atmosphere was analyzed when it passed in front of its host star as some of its infrared light passed through the planet’s atmosphere. Based on the available data, the astronomers concluded that the planet's atmosphere is either a thin but dense layer rich in water steam or a thick layer of high clouds or hazes, similar to those seen in the atmospheres of Venus and Titan in the Solar System. A puffy hydrogen-helium gas envelope like that of Uranus or Neptune is ruled out, unless it's covered by a high cloud layer of noxious hydrocarbons (ESO press release; NASA/JPL news release; and Bean et al, 2010). 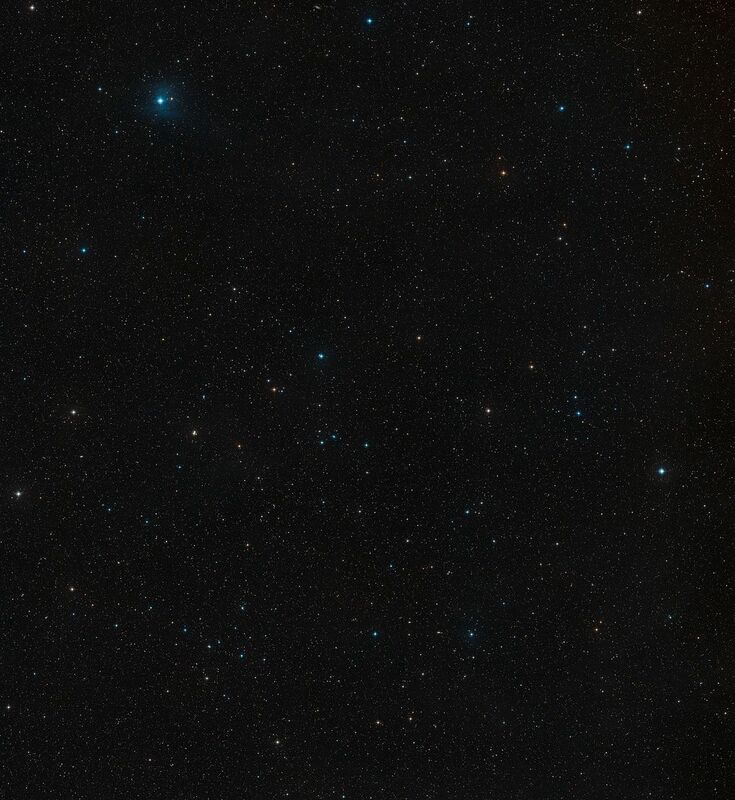 Now commonly referred to as GJ 1214, this dim star lies around 42.1 light-years from Sol. It is located in the east central part (17:15:18.9+4:57:49.7, ICRS 2000.0) of Constellation Ophiuchus, the Serpent Holder -- southwest of Cebalrai and Muliphen (Beta and Gamma Ophiuchi, respectively), south of Rasalhague (Alpha Ophiuchi), southeast of Kappa and Lambda Ophiuchi (Marfik), northeast of Globular Cluster M12 (NGC 6218), Yed Prior (Delta Ophiuchi), and Yed Posterior (Epsilon Ophiuchi), north of Globular Cluster M14, and northwest of Mu and Nu Ophiuchi. 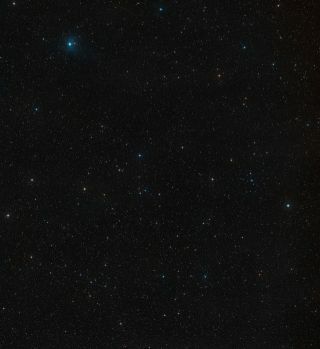 Like other red dwarf stars, however, it is not visible with the naked eye. The high proper motion of this star was detected during the Lowell Proper Motion Survey of the Northern Hemisphere begun in 1957 by Henry Lee Giclas (1910-2007), Robert Burnham, Jr. (1931-93), and Norman G. Thomas at Lowell Observatory and designated as G 139-021 in the Giclas catalogues of faint proper motion stars (Giclas et al, 1971). It was also included in the 1979 Luyten Half-Second Catalogue as LHS 3275 by Willem Jacob Luyten (1899-1994). The star was added to the 1979 update of the Gliese Catalogue of Nearby Stars (CNS, now ARICNS database) by Wilhelm Gliese (1915-93) and Hartmut Jahreiss (Gliese and Jahreiss, 1979) as GJ 1214. A likely hot "steam planet,"
On December 16, 2009, a team of astronomers announced the discovery of a super-Earth in an inner orbit using the "transit method" of planetary detection using "a fleet of ground-based telescopes no larger than those many amateur astronomers have in their backyards" as part of the MEarth Project (CfA news release). With a (revised) diameter of 2.63 ± 0.11 times that of Earth, the planet was estimated to have around 6.6 Earth-masses based radial-velocity measurements using the ESO 3.6-meter telescope and its HARPS spectrograph) (ESO press release; Bean et al, 2010; Charbonneau et al 2009; Geoffrey Marcy, 2009; Rogers and Seager, 2009; Dennis Overbye, New York Times, December 16, 2009; and Ivan Seminuik, New Scientist, December 16, 2009 -- more below). GJ 1214 is a cool and dim, main sequence red dwarf of spectral and luminosity type M4.5 V (NASA Star and Exoplanet Database, based on Hawley et al, 1996). The star has 15.7 ± 1.9 percent of Sol's mass, 21.1 (± 0.97 percent of its diameter, and under 0.02 percent of its visual and over 0.328 percent of its bolometric luminosity (Rogers and Seager, 2009). GJ 1214 is around six billion years old. Some other useful star catalogue designations include: GJ 1214, G 139-21, LHS 3275, USNO 256, and 2MASS J17151894+0457496. With a spectral type of M4, Ross 128 can be used as a rough proxy for GJ 1214 (M 4.5). According to calculations performed for the NASA Star and Exoplanet Database, the distance from Ross 128 where an Earth-type rocky planet may have liquid water on its surface has been estimated to be between 0.06 and 0.11 AU -- well within the orbital distance of Mercury in the Solar System. In that distance range from the star, such a planet would have a "year" of only 13 to 34 days. 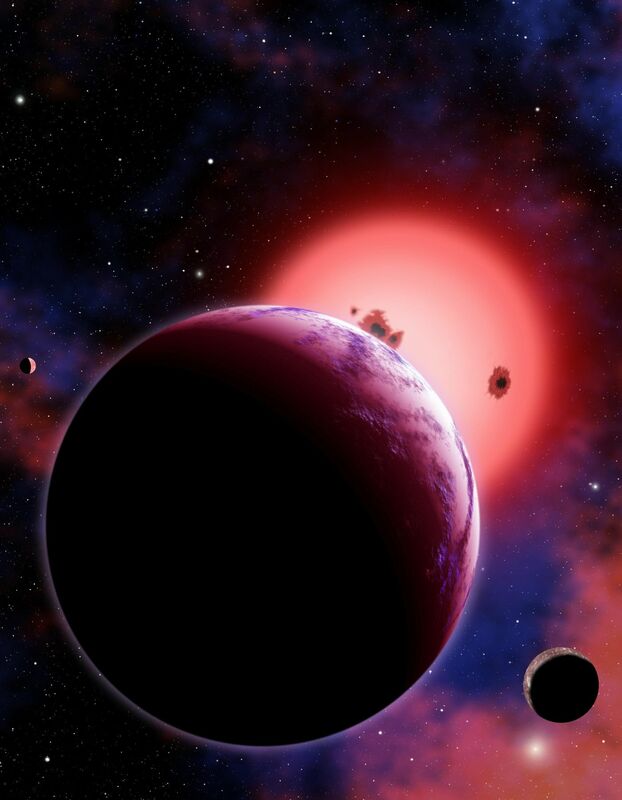 On December 16, 2009, a team of astronomers (including David Charbonneau, Zachory K. Berta, Jonathan Irwin, Christopher J. Burke, Philip Nutzman, Lars A. Buchhave, Christophe Lovis, Xavier Bonfils, David W. Latham, Stéphane Udry, Ruth A. Murray-Clay, Matthew J. Holman, Emilio E. Falco, Joshua N. Winn, Didier Queloz, Francesco Pepe, Michel Mayor, Xavier Delfosse, and Thierry Forveille) announced the discovery of a planet "b" of 6.55 ± 0.98 Earth-masses in a tight inner orbit using the "transit method" of planetary detection using "a fleet of ground-based telescopes no larger than those many amateur astronomers have in their backyards" as part of the MEarth Project (CfA news release). With a (revised) diameter of 2.63 ± 0.11 times that of Earth, the mass of the planet was derived from radial-velocity measurements using the ESO 3.6-meter telescope and its HARPS spectrograph) (ESO press release; Bean et al, 2010; Charbonneau et al 2009; Geoffrey Marcy, 2009; Rogers and Seager, 2009; Dennis Overbye, New York Times, December 16, 2009; and Ivan Seminuik, New Scientist, December 16, 2009). It revolves around GJ 1214 at an average distance of 0.014 AU, in a roughly circular orbit (e<0.27) which it completes in 1.6 days (38 hours), and so the planet must have a very hot equilibrium temperature -- updated in 2011 to around 555 kelvin, 539° Fahrenheit, or 282° Celsius (Desert et al, 2011, page 6). With respect to Earth's line of sight, the planet's orbit is inclined at 88.6 degrees. The planet's mass and diameter are consistent with the hypothesis that it has a low average density due to an inferred composition of three-fourths water (possibly 47 percent) and other ices (that have subliminated into a "supercritical fluid" above an "electronically conductive," dense fluid plasma below a steamy atmosphere) and one-fourth rock and iron in the core. 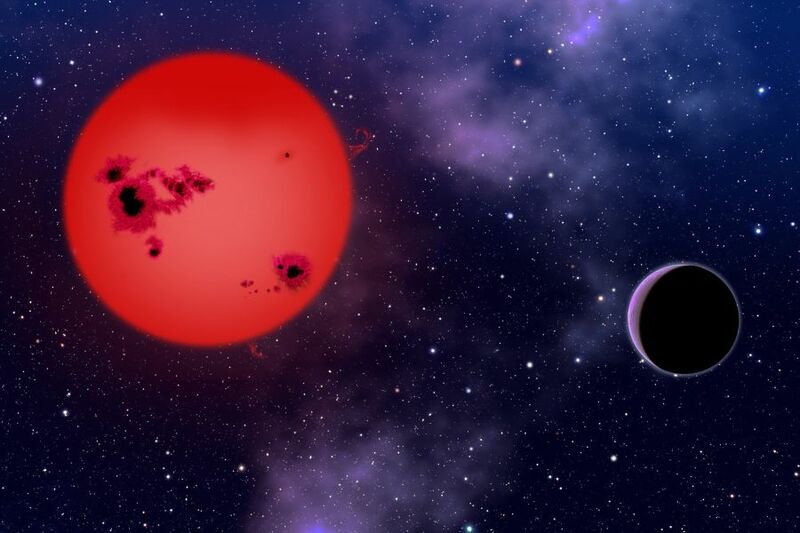 If the planet formed early in the star's development, moreover, then it may have accreted an atmosphere of hydrogen and helium that may be around 200 kilometers (124 miles) thick. At the planet's orbital distance of only 0.014 AU from its host star, however, the surface temperature has been estimated to be around 400° Fahrenheit (200° Celsius), which is way too hot for liquid water. Totalling no more than one percent of the planet's mass, the planet's atmosphere "is probably escaping hydrodynamically" into space, suggesting that the planet has lost most of its primordial atmosphere since formation. An interesting possibility is that GJ 1214 b is a hot "steam planet," with a "steam atmosphere that transitions continuously to a super-fluid without passing through the liquid phase" (Charbonneau et al 2009; Geoffrey Marcy, 2009; Rogers and Seager, 2009). The following star systems are located within 10 ly of Gliese 176, plus more bright stars within 10 to 20 ly. Psi Serpentis AabB? G2.5-5 V ? Up-to-date technical summaries on GJ 1214 can be found at: Jean Schneider's Extrasolar Planets Encyclopaedia; Astronomiches Rechen-Institut at Heidelberg's ARICNS, the NASA Star and Exoplanet Database, and the Research Consortium on Nearby Stars (RECONS). One story is that the Ancient Greeks named this constellation after Aesculapius (the first doctor, a son of Apollo and Coronis, and grandfather of Hippocrates, the famous Greek physician). Aesculapius was killed by Zeus at the urging of Hades for threatening to make mankind immortal like the gods by bringing the dead back to life. In admiration of the doctor's skills, however, Zeus raised the doctor and the serpent from which he had first learned the medicinal usefulness of certain herbs into the heavens. Located along the equatorial region of the sky, Ophiuchus is one of the larger constellations. For more information on stars and objects in this constellation and an illustration, go to Christine Kronberg's Ophiuchus. For another illustration, see David Haworth's Ophiuchus.